Astroneer is a space adventure game, which is currently in the early access phase and you can help the creators by buying the game, which now has many very good reviews on Steam. We like the indie game very much and that is why we have written this beginner’s guide and tips for you. The control in Astroneer can be somewhat confusing at the beginning. There is a separate control for the character, one for the cursor and then another for the terrain tool. - General Movement: As long as you have the terrain tool in the holster, the control behaves normally for a third-person game. On the Xbox One, the left stick is for moving and the right for controlling the camera. The A button is for jumping. On the PC, use the right mouse to rotate the camera, move with the WASD buttons, and jump as you can with the Space bar. - Terraforming: With X on the controller and E on the keyboard you pull your terrain tool and put it in again. In Terraforming mode, you control the camera on the XBox One via the right stick. With LB / RB, you switch between the trenching, adding, and planning mode of the terrain tool. Use CTRL / ALT to switch between the modes on the PC. Use RT on the Xbox One or the left mouse button to do the selected action. Don’t forget to put your tool back into the holster as soon as you're done, so you can move back to normal. - Cursor mode (Xbox only): To switch to Cursor mode on the Xbox One, simply press LT. Now you can change objects in the world, press buttons in your base, and place items in your backpack. Press RT to pick up items, drop them, or snap them into place. - Backpack: With Y on the Xbox One or Q on the PC you open your backpack. Click on the orange arrows to create equipment such as connections, solar cells, and many other things. 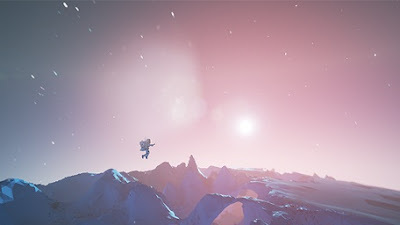 - Connections: The connections in Astroneer are almost your life line. Once you have created it, you can place it on the keyboard with T, or with the control on the console. So you have just landed on your first planet. All you have is your terrain tool, the land capsule and your backpack. The first materials you need now are resin and compound. With resin you build the first simple buildings and with compound the vital connections. - Always pay attention to your oxygen: How much oxygen you still have is indicated as a blue bar on your backpack. If the display falls to zero, you die. So be careful! - Make connections first: you need to find the compound find on the whole map. Look for ghastly heaps. But move carefully away from your capsule, not to die on the way. - Use the terrain tool to collect: After picking up your terrain tool, open your backpack and use the orange arrows to select connections and make them. - Link the connections to your base: This will give you a life line that will be very useful in exploring the planet. Now you can go ahead and building your colony. - To build new basic modules you need resin. So make sure you have enough of it in your backpack. There are pointed, tubular structures that are present on the entire map. - Once you have collected three piles of resin, return to your base. - At your base, LT uses the XBOX to switch to cursor mode. Now extend your base with RT or left click on the PC. - Once you built buildings you can’t destroy them again. So, make sure you get enough compounds before you make a module out of it. You can create three to five compounds, depending on how much space is available. - Once the module is created, you can use the orange buttons again to select what module you want to build. - First of all build a research laboratory and a smelter. The materials needed for this should be very easy to find, since they belong to the ordinary ones. Now you have built a small base from where you can explore the planet and find rare items and materials. In the following, we have compiled a list of currently available modules that you can build in Astroneer. Research laboratory: Through the construction of a research lab, you randomly switch off new modules and equipment. For this you need energy and research objects. You can find these research objects on the entire map. For example in wrecks of other spaceships or alien plants. Once found, you have to loop them back to your base. Since the research objects can also contain rare materials, it is worthwhile to build a research laboratory next to your mine. Smelting: This module converts ores into bars, which you need to build more complex buildings. Garage: The garage allows you to make your own vehicles, like the Space Buggy. Printer: The printer is the improved version of the printer in your backpack. This allows you to create larger objects. Trading platform: The trading platform can be used to exchange resources. Fuel condenser: These modules convert energy into hydrazine fuel. This, in turn, you can either use for action or refuel your shuttle to explore new worlds. As in other similar games, mining also plays an important role in Astroneer. So you find the rarest minerals only in mountains and underground. Finding these ores can be difficult and, above all, dangerous. Here are a few tips to help you survive in underground. - Don't dig directly down, you might know it from Minecraft. Caves you find quite often and these offer you good possibilities to pull your supply hoses. - In any case, it is important to take many of the connections with you so that you don’t stifle on the way. - Also remember that you have enough batteries and your base is well powered, as mining consumes an enormous amount of energy. - Don't dig exactly under your feet. It can happen that you dig into a cave and immediately fall into it. If you are then cut off from your supply line, the lights quickly go out. - Underground you find ores such as copper, aluminum and titanium. Later, you need to build complex buildings. We are just in the middle of exploring the planets in Astroneer. Our guide is far from ready. We will expand this soon as we have gained further insights.